"I know a man—and I just want to talk about him a minute, and maybe you will discover who I’m talking about as I go down the way because he was a great one. And he just went about serving. He was born in an obscure village, the child of a poor peasant woman. And then he grew up in still another obscure village, where he worked as a carpenter until he was thirty years old. Then for three years, he just got on his feet, and he was an itinerant preacher. And he went about doing some things. He didn’t have much. He never wrote a book. He never held an office. He never had a family. He never owned a house. He never went to college. He never visited a big city. He never went two hundred miles from where he was born. He did none of the usual things that the world would associate with greatness. He had no credentials but himself. He was only thirty-three when the tide of public opinion turned against him. They called him a rabble-rouser. They called him a troublemaker. They said he was an agitator. He practiced civil disobedience; he broke injunctions. And so he was turned over to his enemies and went through the mockery of a trial. And the irony of it all is that his friends turned him over to them. One of his closest friends denied him. Another of his friends turned him over to his enemies. And while he was dying, the people who killed him gambled for his clothing, the only possession that he had in the world. When he was dead he was buried in a borrowed tomb, through the pity of a friend." Joseph of Arimathea was the man who assumed responsibility for the burial of Jesus after Jesus' crucifixion. This secret disciple of Jesus asked Pontius Pilate that he might take away the body of Jesus, and Pilate gave him permission. Joseph immediately purchased a linen shroud and proceeded to Golgotha to take the body of Jesus down from the cross. There, Joseph and a Pharisee named Nicodemus took the body and wrapped it in linen cloths with the spices that Nicodemus had bought. 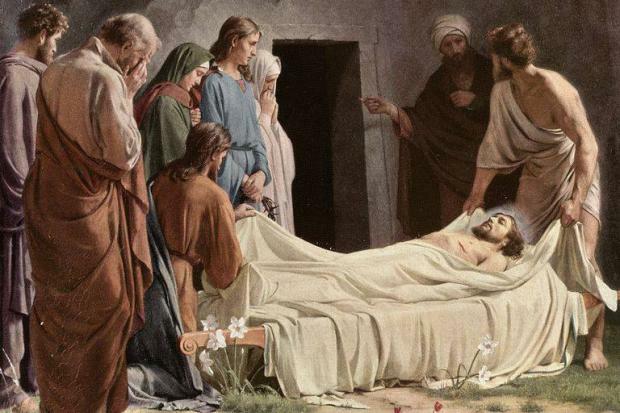 The disciples then transported the prepared corpse to a man-made cave in a garden of nearby. The Gospel of Matthew alone suggests that this was Joseph's own tomb. The burial was undertaken quickly because the Sabbath was drawing near. Once they were certain everything was done correctly, Joseph of Arimathea rolled a great stone to the door of the tomb, and departed. It was rare to find a stone entrance to a Jewish tomb in biblical times; most Jewish tombs had doors with certain types of hinges. A large stone rolled before the tomb would be much more difficult to move, making the burial site more permanent. Roman governor Pontius Pilate instructed guards to be posted at the tomb to prevent Jesus’ followers from removing the body to claim that he had risen from the dead. Reverend King said himself that Saturday was the day that God himself lay cold in the grave. Friday was death, Sunday was hope, but Saturday was that seemingly ignored middle day between them when God occupied a dirty grave in a little garden outside Jerusalem. Saturday is about waiting, about uncertainty, about not knowing what’ll happen. Saturday is ambiguity. It’s about, as one theologian put it, “muddling through” when the future isn’t clear. Holy Saturday is a day to sit, wait, hope... unsure of what’s to come tomorrow.